On top of the Peugeot 208 Racing Cup and Peugeot 308 Racing Cup - which will remain active - Peugeot Sport is deploying its know-how and reinforcing its range of circuit racing cars with the new Peugeot 308TCR. Bruno Famin, Peugeot Sport Director: "The Peugeot 308 RACING CUP was already eligible for the TCR, but the rapid development of championships based on TCR regulations inspired us to go further in looking for performance to accompany the ambitions of our customers, all the way up to the very top level - which from 2018 will be represented by the FIA World Touring Car Cup (WTCR). So, the arrival of the new Peugeot 308TCR comes at just the right time, illustrating the deep engagement that Peugeot Sport enjoys with its customers. In order to meet their justified demands, we've used our experience and expertise to come up with a car that is competitive, reliable and always increasingly enjoyable to drive." 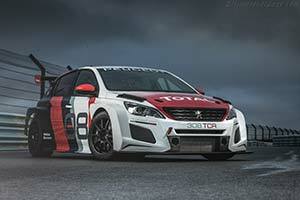 Mayeul Tyl, Peugeot Citroën Racing Shop Director : "The arrival of the Peugeot 308TCR answers a strong demand from within several closely-fought national and international racing series. Our ambition is to step up to the next level when it comes to competitiveness; not just from a sporting point of view but also from an economic one. Running costs were a key factor as we developed the car, without compromising performance or reliability. Some safe technical choices and a reasonable purchase price of 109000 (before taxes) have allowed us to provide a very competitive cost per kilometre of 4.5, not including consumables." The THP engine benefits from a robust base that has already demonstrated its capability to withstand significant amounts of power per litre. Plenty of work has been done on the induction, the exhaust, and turbocharging - allowing the turbocharged 4-cylinder block to develop 350 horsepower and 420 Nm of torque from 3000rpm, while maintaining the potential to cover 5000 kilometres: nearly double the amount needed for an entire WTCR season! The numerous set-up options available for the car (ride height, track, and camber - both front and rear) allows the chassis set-up to be adjusted for all circuits, to suit every driver. When it comes to braking, the Peugeot 308TCR is also well-equipped, making use of 378x34 mm ventilated disks at the front with 6-piston callipers, and 270x12 mm disks at the back with 2-piston callipers. A new pedal box - completely designed with racing in mind! - finishes everything off, giving the driver all the tools needed to master the car perfectly. The bodywork of the new Peugeot 308TCR has been jointly created by Peugeot Sport and the designers from the 'CENTRE DE STYLE Peugeot', achieving optimal aerodynamics within an athletic silhouette, thanks especially to plenty of development work using CFD, and an impressive design. The front bodywork - which has been particularly carefully designed - allows a perfect flow of air towards the radiator and the intercooler, essential for performance and reliability, while the splitter generates maximum possible downforce to provide directional stability. At the back, the rear bodywork is characterised by a large diffuser, to produce more downforce.